The future role of SharePoint with the advent of Teams has been on my mind for over a year now. Teams is built on top of SharePoint but is an application rather than a website. Teams has chat and collaboration, but SharePoint has news and is interconnected with related sites through Hub sites in sometimes a more intuitive interface. Teams is gaining more user adoption with its modern way of creating an efficient workplace. The governance and admin controls are on their way for Teams too. Which should you use? Do you have to make a choice? As a SharePoint and Teams provider, it has been hard to determine if Teams was there to replace SharePoint or that it would work side-by-side with SharePoint. My initial thoughts were that SharePoint would be the organisation intranet (communication sites), a place to go for company-wide communication and resources. Microsoft Teams or SharePoint Team sites were great for small-medium team collaboration. 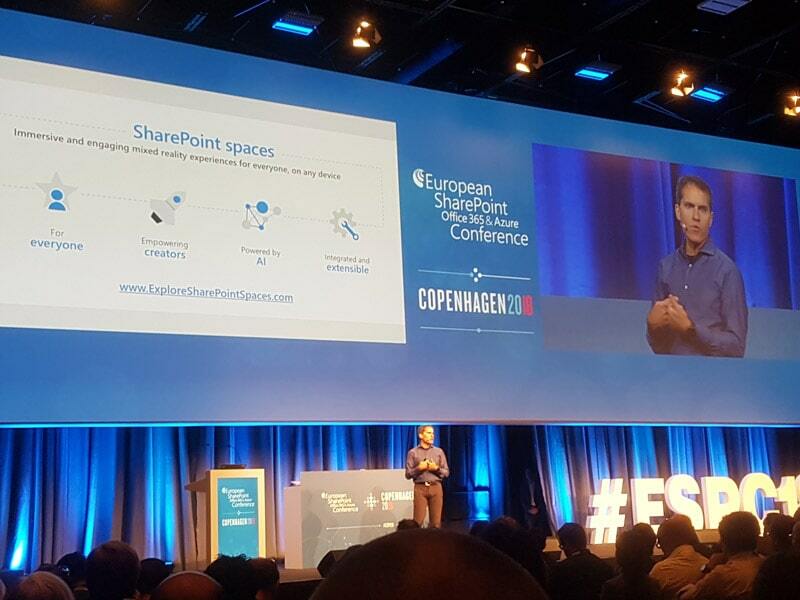 At the European SharePoint, Office 365 and Azure conference 2018 in Copenhagen, Jeff Teper (Corporate Vice President – Office 365) explained the vision for SharePoint and Teams. The vision Microsoft have is that SharePoint Team sites and MS Teams live side-by-side. In fact, they should be the same collaboration areas but accessed through different mediums. Eventually everything in SharePoint should be surfaced in Teams. Recently Microsoft have released an option to create a Microsoft Team from a SharePoint Team site, this even adds a cool link to open the Team. The release of SharePoint Framework (SPFx) web parts for Teams supports moving towards this goal, surfacing the same functionality for both platforms (just in a different shell). It also works the other way around, Microsoft Team SharePoint Team sites (the site behind the Team! ), can be added to SharePoint Hub sites just like any other SharePoint site so news and events can be aggregated. When planning site architecture, we can now imagine that whatever site or team is planned in either SharePoint or Teams, both could be accessed with either application. There are still going to be instances where one is preferred over the other. In some scenarios, Office 365 groups with owners and members might not be the preferred access model for SharePoint intranet sites but there is a valid option for these sites – modern communication sites. Microsoft mentioned that they will be closing the gap on differences between communication and team sites and that one day you should be able to convert one to another. This again would help organisations on a long journey moving to a modern team-based flat structure. More exciting updates to come…. This entry was posted in Business, Hub Sites, Microsoft Teams, Modern Experience, Office 365, SharePoint News, SharePoint Online, SharePoint Online Permissions, Site Collections, Tony Phillips, Uncategorized and tagged Cloud Design Box, ESPC, European SharePoint Conference 2018, Flat Structure, Hub Sites, Hubify, Hubs, Microsoft Teams, Modern SharePoint, Office 365, SharePoint, SharePoint Online, Site Architecture, Sites, Teamify, Teams, Tony Phillips on November 28, 2018 by Tony Phillips.